Idylic refurbished bungalow situated on the edge of the shore line of Punta Mujeres. Free Wi Fi. 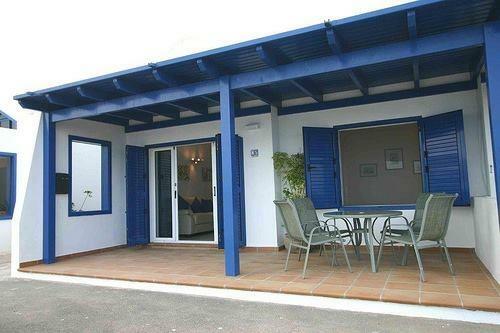 We own a property on Lanzarote and spend about 14 weeks on the island every year. We love our home and are happy with where it is situated, HOWEVER, we thought it was time to try a different location. We have always wanted to be near the sea (our home is rural and inland), so we decided to stay in an oceanside property for a week. Well, what a revelation! We rented Tres Palmeras in Punta Mujeres for a week in June. What a lovely, lovely home (and yes, although not huge, it IS a home!!). It is kitted out with all modern conveniences, it has two bedrooms and is wonderfully comfortable. We found the bungalow to be clean and perfect in every way. At the front there is an unrivalled ocean view - from the front terrace (equipped with comfortable chairs and a table), the ocean is only a few metres away!! The sound, the saltwater smell, the fresh breezes and the views are truly, truly spectacular! Everything about the bungalow is perfection. From the booking process with Amanda to the arrival in a very welcoming home, it could not have provided a better holiday. We are, of course, now kicking ourselves for not buying ON the sea (as Tres Palmeras is), however, we can spend an odd week or two here a year to fulfill that dream. And it does fulfill that dream admirably. We LOVE the sound of the sea and will return here as often as we can (did we mention there are many lovely restaurants within walking distance??). Thanks to all at Lanzarote Villas Direct for making this a PERFECT week. We cannot recommend them or this bungalow highly enough. One of a set of privately owned seafront apartments and we do mean seafront - only a few metres from the Atlantic breakers! The public promenade passes right by the front patio so you will soon be exchanging greetings with the locals. However not too much foot traffic so we found it acceptable. IKEA kitchen and bathroom fittings, comfortable sofas and good range of British TV and radio channels plus dvds. There is a pleasant sheltered back garden, complete with the three palm trees. You'll need a car to access Tres Palmeras itself and the Manrique inspired sites of the north of the island. 5 minutes stroll to excellent friendly Lago restaurant. More restaurants in Arrieta you can drive to, plus a couple of small well-stocked supermarkets; one at the petrol station and one in the village. There is a small mini-market in Punta Mujeres, a few minutes walk away. The beauty of the sky at night (no light pollution) and the constantly changing ocean vistas should soon work their magic on you. Arrieta and Punta Mujeres represent a Lanzarote from 25 years ago. Great for de-stressing and practising that Spanish! More for grownups than families with kids probably, although Garita beach, a 5 minutes drive away, is family friendly. If you want to chill for a week this is the place to go. Yet it’s only a short walk to a nice restaurant. There’s plenty more within a short drive. Totally recommend this property for a relaxing break.